THE VELVETEEN RABBIT - NJB JimdoPage! When Joe was 12 years old, he appeared in an original local stage musical version of The Velveteen Rabit, based off the popular childrens book. The musical ran at the Forum Theater in Metuchen, New Jersey. This show technically marked Joe's professional theater debut due to a contract by the Actors Equity Association (AEA) that the actors performed under. Joe played the lead role, "The Boy". A live recording of Joe in this role exists in the sole custody of the composer, Paul Farinella, for archival purposes. A CD of certain highlights of the show was recorded, but Joe was not featured on it. ..:: A little something about the show ::.. 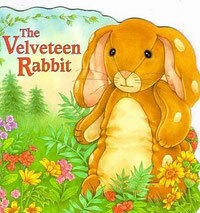 The Velveteen Rabbit is (presumably) based off the classic childrens book of the same title. It is the story of a young boy's favorite toy, a stuffed rabit who longs to become real through the love the boy gives him. "The Boy" is the owner of the Velveteen Rabbit. He becomes ill with scarlet fever and is shipped overseas to be treated. In the end of the story, he encounters a real rabbit who he thinks resembles his old Velveteen Rabbit (hint hint). The show was actually in the month of April in 2002; primarily Saturdays at 11:00 AM, though there was one Sunday show on the 7th at 11:00 AM. I currently have 8 pictures of Joe during the show. The Velveteen Rabbit opened in March, 2002 at the Forum Theater and ran for several months. I had the pleasure of seeing it and the production was great! Joe was wonderful as the "boy," which was a big part for a small child to play. It was an Actors Equity production so everyone was very talented, professional and had great voices. Joe did get his union card from Velveteen, which was amazing for a child. The thing I remember most about it was that the music and lyrics were really outstanding. The Velveteen Rabbit was honored that year, maybe as best musical or something, in New Jersey. Performances were on the week end and during the week, which is when I saw it with a school group. Like many of the shows at the Forum, it toured. I also saw the touring production, but Joe was replaced by then. It was an exceptionally good production, well written and performed. @magali Joe was 12 at the time because the show was in March/April of 2002 and he didn't turn 13 until August.